we are more – act for culture in Europe is a Europe-wide campaign for the arts and culture. It was launched in October 2010 and will run until 2013, when the EU decides about its next multiannual budget for the years 2014-2020. 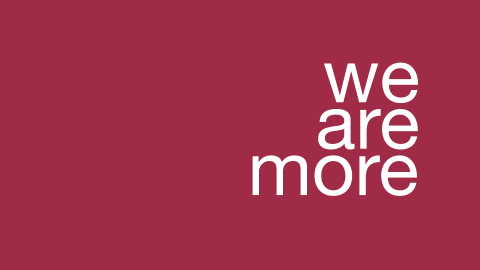 The we are more campaign promotes culture, heritage and the arts, together with education, social cohesion and environmental sustainability, as key areas in which the EU has to make more bold investments if it wants to reach its growth objectives and Europe to remain a thriving democracy in the future. We want to make sure that the EU contribution to culture is explicit and with a stronger financial envelope. Download Culture Action Europe’s call for actors involved in the Trilogue negotiations to reduce costs for administration and re-allocate the savings to programmes and policies, with Creative Europe as priority. Published on the 5th of June 2013. Download Culture Action Europe’s reaction to the Council agreement published on the 11th of February 2013 in English here and in French here. Download the campaign statement on the European Commission’s budget proposal published in July 2011 here. Culture Action Europe, in the framework of the we are more – act for culture in Europe campaign welcomes the European Commission’s proposal for the next EU Culture Programme Creative Europe but calls for an improved recognition of the social dimension of arts and culture and the importance of risk taking and experimentation. Download the letter on the Creative Europe negotiations sent to President Barroso as well as relevant members of the EP in April 2013 and signed by more than 200 cultural organisations. Download our reaction to the European Parliament draft report published 8 November 2012 in English here and French here. Download our statement on the EU Council of Culture Ministers’ position published in May 2012 in English and French. Download our statement on Creative Europe published in February 2012 in English and French. Read more about the background here. Culture Action Europe, in the framework of the we are more – act for culture in Europe campaign, welcomes the European Commission’s proposals for the next Cohesion Policy 2014-2020 and calls on the Member States and the European Parliament to support its overall envelope and to reinforce their commitment to economic, social and territorial cohesion. The EU Cohesion Policy 2014-2020 should support the role that cultures and arts play in local and regional development, in particular through their impact on social inclusion, education, creativity and on the individual and collective capacity to adapt to change and innovate. Download our statement on the EU Regional Policy Funds published in April 2012 in English and French and read more here.